If your laptop is still under warranty you shouldn't even be contemplating this. 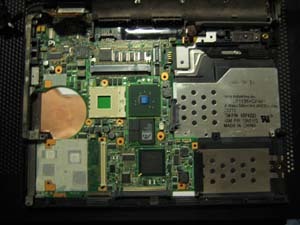 Send the laptop to Lenovo to get the motherboard replaced. This is a relatively short guide but make sure to read it carefully and make sure you have all the equipment you will need. Let me talk briefly about your choice in infrared thermometer: make sure the maximum range is above 230c since this is the temperature we need to reach for a proper reflow. Ok, I am not going to go into detail about how to take each piece off of the laptop. 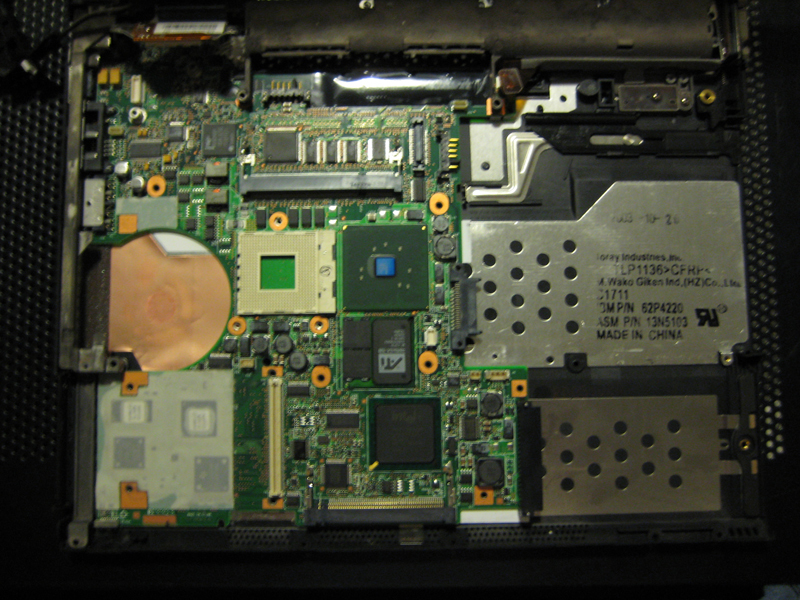 You are going to have to take every part of the laptop out, so just follow the hardware maintenance manual. 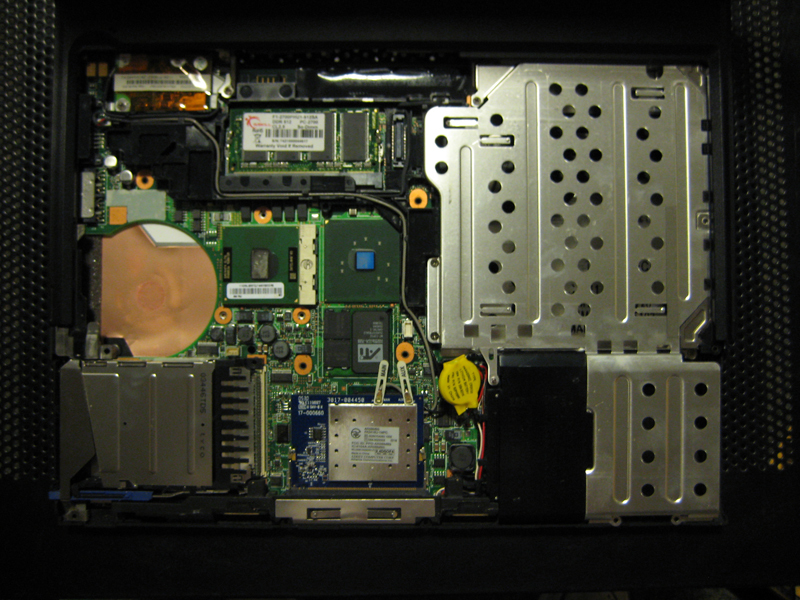 Start by removing the simple stuff - keyboard, palmrest, cpu fan, memory, etc. The next thing you should take off the laptop is the LCD screen. This will make taking everything else out easier. After removing the LCD you will be able to remove just about everything else easily. After taking out the LCD screen and the keyboard bezel remove the metal cages that hold the ultrabay drive and hard drive (you should have taken the hard drive out already). Also remove the PCMCIA ports while you are at it. By now you will see why its a good idea to have a great organizational scheme for all the screws. There are quite a bit. We are now starting to get down to the motherboard. Don't forget to take out the screw by the USB ports than connects the motherboard to the chassis. After you take out the remaining parts connected to the motherboard and chassis the board will slide out with relative easy. DO NOT FORGET TO REMOVE THE CMOS BATTERY! manteiv wrote: I had a minor incident though, I left the CMOS backup battery connected. Despite it was hidden and inside the alunimum wrapping, it exploded during the reflow, causing a loud noise and smoke. There was no damage done to the board, I was lucky. The next item on the list is to cover the board in the aluminium foil. Use two layers of foil and don't press it flat against the board. 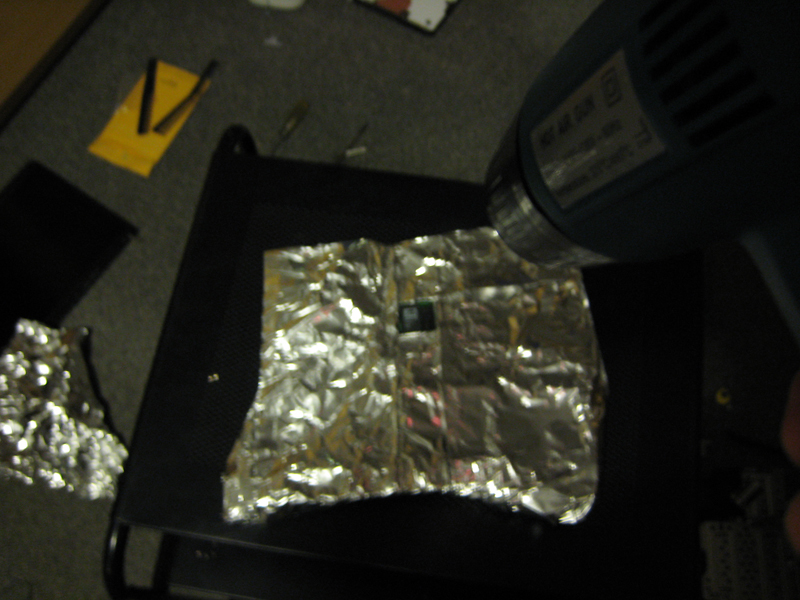 This will take away from the insulating properties of having a layer of air between the foil. However, you are going to want to crimp the ends that surround the GPU a little bit. This will help keep the foil together and the heat out. If you wrap the board correctly you won't have to worry about any of the plastic connectors - even the ones right next to the GPU. So what's the next step? Add heat! Now if you'll notice, I am holding the heat gun a distance away from the board. This brings me to one of the most important parts - you want to heat the GPU SLOWLY. Not like 1c and hour, but you don't want to blast it with the heat. About 10c a minute is a good rate until you get to 150c, then you can speed it up a little bit to 20c a minute. Keep checking the temperature with the infrared thermometer. Doing a reflow is very hard if you don't know the temperature! Once you see a temperature of 245c on the thermometer maintain this for a short period of time (10-20 seconds). You do not want to go above 260c. After maintaining 245c start cooling the GPU down. Just like how we heated the GPU up slowly, we are going to cool it down slowly too. Dropping the temperature by 15c a minute is a good rate. Once you get the temperature down to 150c you can turn off the heat gun and just let the board cool itself from there. Now just play the waiting game. Wait until the GPU gets down to 38c before you even think about moving it. Do not get impatient! If the solder has not cooled down enough and you move it you WILL break it! There are a couple of things I want to note. After you turn the computer back on you will need to reset the time and date and if you used the no 1802 bootable iso to allow a non-ibm wireless card you will need to use it again. When you remove the CMOS battery the BIOS resets itself. To the those who have ended up with non-working boards: Do not attempt a second reflow. You should just buy a replacement motherboard. You might also want to have a look at this thread. Last edited by visionviper on Sun Mar 13, 2011 12:48 pm, edited 16 times in total. Thanks for the post, will see if this can be stickied. Has my vote for a sticky. Nice documentation on the equipment needed and the procedure! For my attempt at fixing my A31/A31p video problems, I have a Craftsman 81079 multimeter which has a built-in IR thermometer capable of measuring up to 270C purchased specifically off of eBay ($40). I also have some special insulating rubber material from work which could take the place of the aluminum foil but it's not something readily available to most people. It will completely insulate the area surrounding the video chip but I don't know if I can get it to sit down onto the board so the hot air doesn't flow outward from the target (and loosen up any nearby parts). Not sure if I'll use that or just rely on the Al foil. For the heat gun I'll either borrow one from work or find one on eBay or at a local hobby/crafts shop. 1500 watts, huh? I've been trying to find an infrared heater but they either don't reach a high enough temperature or are too expensive to make it worthwhile for the two systems I need to repair. Heating up surface mount components to remove them completely from the printed circuit board is real easy to do. 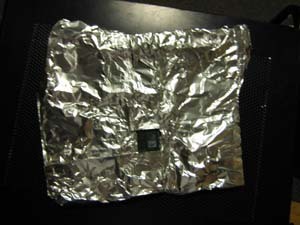 I helped out my boss last week to get a stacked flash chip off an MCM (multi chip module). 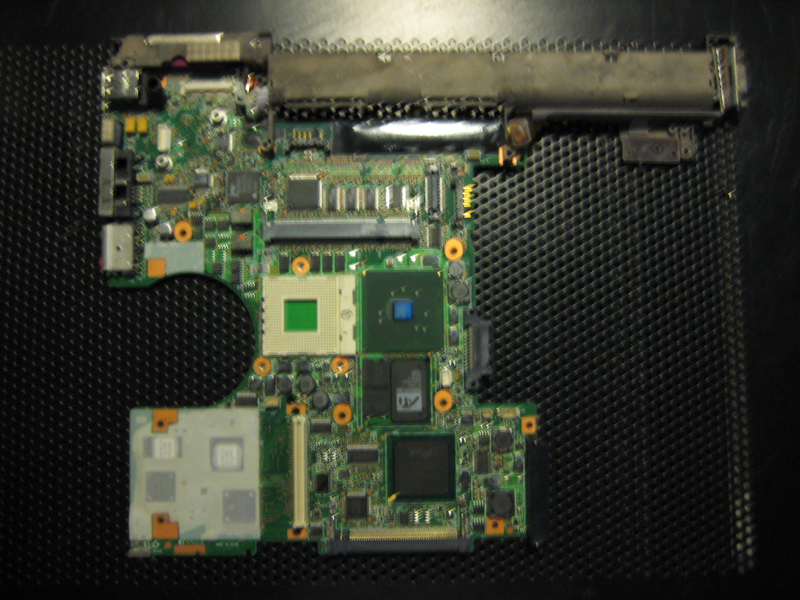 We also made a couple of other parts slide around (and off) the PC board, but we didn't care about any collateral damage . Keeping the target chip being re-flowed in one spot is very important otherwise you will be doing more harm than good. It looks like only the top side of the board was subjected to the heat. Was there anything done to apply some heat to the bottom in order to spread out the effects of thermal expansion? Pistol style IR thermometers can be obtained at most auto parts stores and are available at pretty reasonable prices, especially if you wait for a sale. visionviper, you've made a very significant contribution to this forum. Thanks so much! Totaly insane. This takes tweaking your system to a new level. Maybe someone on the forum will offer to "rent" the thermometer and heat gun on a per use basis? Perhaps $10 - $15 for a week including one way shipping? I doubt buying them makes sense for most people. Thank you for the significant contribution. rkawakami wrote: It looks like only the top side of the board was subjected to the heat. Was there anything done to apply some heat to the bottom in order to spread out the effects of thermal expansion? Heating the top, in my opinion, solves this problem. When you heat the board slowly you allow the heat to penetrate the board and reduce any temperature difference. It helps if you are doing the reflow on something that will hold some heat. As the space under the area of the board the GPU is connected to warms it warms the air around it. Having something like metal will help keep heat there. You don't want to move the board while reflowing either. underclocker wrote: My only outstanding question is what non-standard issue wifi card are you using in your machine? It's an Atheros wireless card. I am glad this guide has been so well received. I hope some members of the forum can put it to good use! Last edited by visionviper on Thu Aug 13, 2009 3:27 am, edited 1 time in total. Wow, this is exactly what I was looking for. Thank you! My T40 has some non-phillips screws on the bottom for some reason--from what I googled, they're Torx T7 screws with hollow security pins (star shaped with a pin in the middle); I'm heading to my local hardware store to see if I can find matching screw heads. Does anyone else have these? With regard to the wireless card, I purchased my laptop with an Atheros pci wifi (not the intel centrino version as I recall). Does this mean I'll need a special boot disk to enable it to work afterwards? Also, what surface did you do this on? Did you wrap the aluminum foil on the bottom of the board too? Again, great job with the DYI guide. dieselman8 wrote: With regard to the wireless card, I purchased my laptop with an Atheros pci wifi (not the intel centrino version as I recall). Does this mean I'll need a special boot disk to enable it to work afterwards? If it is not a card that IBM sold for the T40 then yes you will need to use the no-1802 bootable disk. You have to apply this fix before you install the wireless card. If you boot up your laptop and see the Pentium M logo instead of the Centrino logo then you will probably have to apply the fix. dieselman8 wrote: Also, what surface did you do this on? Did you wrap the aluminum foil on the bottom of the board too? I did it on a small metal table I had. You don't need to wrap the underside of the board in aluminium. All you need to be concerned about it covering up the top of the motherboard and leaving only the GPU and video memory exposed. I don't want to throw cold water on anyone, but the German PC board designer I wrote about in various other threads, who had tried reflowing in a professional hot vapor oven with little success and wanted to try reballing GPU chips, now writes that when he removed the BGA chips he found some of the PCB pads actually detached from the mainboard. The problem was thus not merely one of bad BGA connections. How much this has to do with "brutal" BGA removal (he claimed he was very gentle) and how much is actual fact is something I can't answer, but this "flexing" problem is only becoming more difficult and murky by the day. Last edited by Robbyrobot on Sun Feb 10, 2008 11:13 am, edited 1 time in total. If that is the case then a percentage of these board are not repairable at all no matter who tries to repair them or which method they use because the pads lifted on the planar. So then it is possible to spend money on reballing only to find out that the planar board is unrepairable. I think this adds more credibility to reflowing it yourself. 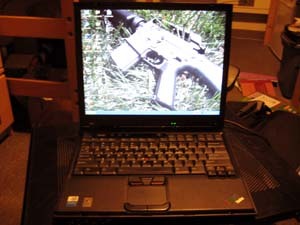 T60 2623-D7U, 3 GB Ram. Dual boot XP and Linux Mint. That's the way I see it too. I'm trying to get the guy to post pictures of what he found and if he does will certainly post the links here. I agree. Especially considering that if you wanted you could sell the thermometer and heat gun on eBay to recover most of the initial investment in fixing the laptop. Robbyrobot wrote: I don't want to throw cold water on anyone, but the German PC board designer I wrote about in various other threads, who had tried reflowing in a professional hot vapor oven with little success and wanted to try reballing GPU chips, now writes that when he removed the BGA chips he found some of the PCB pads actually detached from the mainboard. The problem was thus not merely one of bad BGA connections. I don't know... Ask him if he did it by vacuum - the only way to pull out a BGA chip and not destroy the balls (by bridging them or lifting the pads) is to use special vacuum pump that pulls the BGA as soon as it hits the solder melting temp. These pumps are very expensive, and can be only found in professional BGA rework stations - without these, taking out a BGA that has 696 pads is, by very least, insane. The strength of the vacuum has to be precise for every chip specifically, thus a very high price. Next fact - it's not a hard thing to lift a pad - by only heating it 20-30C over the limit, or holding the temp high longer than needed, you'll lift it, because the copper is too thin to hold on supstrate with a simple glue that's mostly used for FR-4 boards. Try to heat a pad with a soldering iron - it'll lift in the matter of seconds. So, ask him if he did it by vaccum, if he didn't, then blame it on his "gentleness", since that cannot be done with chips that complex, and that big. My guess is no, but as of now, I still haven't managed to get pictures out of him. What you mention would make everything just one increment harder, and any repair that much less likely to succeed. As of this moment, my impression is that a "flexed"n T4x board is scrap and if a heat gun, oven or any other semi-brutal method happens to work for even a while, there's no loss involved. This is a great disappointment for me personally. I just reflowed my T40, following the Youtube method (search for reflow T41P). It works! Grabbed the manual from lenovo.com for the dis/assembly procedures. That's great. Another T40 saved! I bought a T40 on ebay and after 2 months I started to see garabage on the screen after 30 minutes of use, if I keep using it, it gets worse. I also see the same effect on the VGA and TV-Out outputs so I think it's a video ram problem. Ok, found a new motherboard on ebay and bought it, the machine worked for 2 months and now It's dead, try everything, memory, processor, screen, nothing, from time to time I get 1 Long Beep and 2 Short Beeps. Looking on the net I found this post, do you think that this could be my problem?. I wont buy another motherboard hehe, I already have two!! with similar problems. Now how it's possible that only in two months died!, could it be some bending on the casing that cannot be seen in plain sight?. If I get it working, how to prevent it to happen again?. Another question, a hot air weller soldering station will do the trick or it's temperature is too high?. I'm electronic technician and repair things in a regular basis but never touched something THAT complex and I'm a little afraid to get it worse. (luckly have 2 motherboards, just need to do it right once but better ask you that know how to do it properly). BTW: Sorry for my bad english, I'm not a native english speaker. Hi, Thanks for answer, I know that, I read the IBM error codes for T4x Series. Memory works Perfect (both 512M SODIMM 333Mhz) tested on a VIA EPIA-TC10000. LCD assembly and everything else works perfectly, I just replaced back to my older motherboard that has the bad habit of write crap on the screen after a while (video ram problem) specially if I type hard. The only issue I have with this rework method is the use of Aluminum foil as the heat shield. It should be mentioned with or without using the Al foil to use a static strap or at a minimum keep yourself grounded while doing the rework. Aluminum is an excellent conductor and if there is a static discharge to the foil you can cause more problems with the board than the one you are working on. I recommend using thermal tape around the area being worked on, or some other non conductive non flammable material. Ok, guys and now for some tech q's... What emission should I set the thermometer to for R7500? Ok guys, this method works. Period. Just saved a T40 with a M7 by following this instructions. Got the GPU to 230C and lowered it to 100C (the full job takes about half an hour). Powered on, been playing mp3, and movies for the whole week - no probs. The one thing I would like to say is that I think the best method would be somewhere between the YouTube and this method - this board did bend a bit, and I had some problems putting it back in the case. Nevertheless, it works as if it were new - no problems at all. Reflow of the BGA - What about flux? I have aquired a used convection reflow / rework unit that I am looking to use to fix some boards I have. I have read up on the profiles and feel comfortable on that. The unit I have has the ability to create "profiles" (Metcal QX2) So I will use the thermacouple and progam the unit per the info I have obtained here. What I have not been able to determine is the use of flux. I know that it would be darn near impossible to get under the GPU, but was wondering if the flux was viscous enough;I could use compressed air around all four sides of the BGA package to introduce it into the area as best as I can. Do I need to use flux when reflowing? Can someone recomend a decent flux for lead free solder, preferably one that would flow under the chip with some compressed air. I have 2 expensive coasters, the second replaced the first really dead t40 which couldn't post even with pressure on GPU. Just heat gun n go as far as I'm concerned. Did the first one last night and only for practice for the second. Never thought it would even turn on let alone post, and whadda yuh know!! Perfect IBM splash screen first and every time!! Not at all effected by mild flexing, and I hope it holds up!! 95+% improved as far as I can tell. Gonna do the better one tonight or tomorrow, and keep it as a spare if the other one fails again!! *** IF!! **** But it probably will. The most reliable fix,by far. I can't really see how the bulk stuffing or wedge method can be a viable alternative except really short term.